Workers are busy Wednesday at the Hickory Hollow complex, inside and out. If you’re wondering what it will cost to live in one of the 48 units of Hickory Hollow, the first apartment complex to be built in North Albany, read on. The complex, on Hickory Street west of North Albany Road, was started over the objections of what had been mostly a single-family residential neighborhood. But it was allowed by the existing zoning, and the city of Albany signed off on the site plan as proposed. Construction of the four buildings of 12 units each is nearing completion, and a few readers have asked me about rental information. The developer, Charles Weathers of Salem, said he would keep me posted, and on Tuesday he did. Diversified Property Management and Real Estate Services, on Airport Road in Albany, listed the three types of Hickory Hollow units among its other offerings and said they would be available in August. A one-bedroom apartment of 728 square feet, with one bathroom, will rent for $895 a month, with a security deposit of $600. For two bedrooms and two baths (952 square feet) the rent is $1,095, with a security deposit of $800. Apartments with three bedrooms, two baths and 1,127 square feet rent for $1,295, and the security deposit is $1,000. Water, sewer and trash service cost an additional $35 or $60 a month, depending on the unit. For pets, add another $50 monthly. The complex charges a $45 application fee per adult. All the units have in-home washer/dryers and balconies or patios. The kitchens have stainless steel appliances and granite counter tops. Besides landscaping and parking, the complex has a playground and a dog park. Tenants may find useful that there’s a supermarket within walking distance, across North Albany Road. The North Albany IGA Supermarket and ACE hardware store is scheduled to open April 18. There is a critical shortage of housing throughout most of the state. With home prices rising not everyone can or wants to own a home. The rents seem reasonable for brand new units. The location is great for transportation with the bus stop, shopping and medical services all within walking distance. I wouldn’t say it’s horrible, but I agree Jacob, with the proximity to the Bonaventure, as additional care is needed you can move just down the block. Next development that makes sense will probably be a nursing home. FYI, adding water, sewer and trash service outside the rent is the newest trend. It wouldn’t surprise me to see outside charges for city services and schools coming up. A lot of people are complaining about rising rents so we need to separate line items to inform tenants where those increases are coming from. 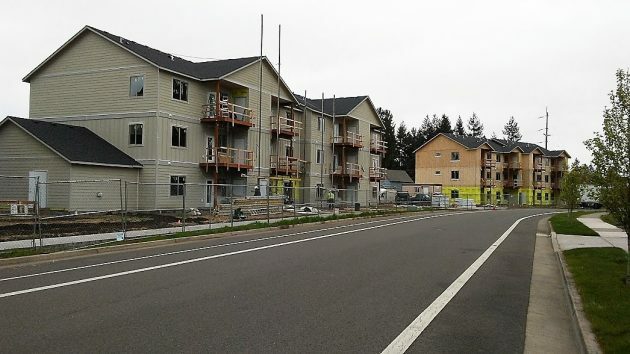 Talk about your “slippery slope.” If the gentle folk of North Albany aren’t careful, in no time at all, the landscape will be consumed by a continuous row of “Senior Housing” units…each more tacky than the previous. Pleasantly painted prisons. And, imagine the traffic across the bridge each day as the Senior population lemmings overrun the formerly placid N. Albany. Ambulance runs, funeral processions, and a host of other problems too gruesome to consider, a kind of Hades on Earth. 1 – Those who want more or bigger parking spaces pay their fair share of the real cost without having arbitrarily limited space and without passing the cost to everyone else. Fairness all around. 2 – Discourages car ownership. Encourages alternatives. Less congestion, noise, pollution, road wear, etc. Benefits everyone including single-family-house owners with cars. more car owners than Complex B which has extra space. Complex B sells permits to Complex A residents and everyone’s needs are met. The city also makes money by selling permits for nearby on-street parking. Apartment and business owners could boost income by selling premium parking (e.g. private garages with electric car charging, etc). Need provision for short-term parking (rented cars, etc) at proportionate cost. 4 – The combined effects of #2 and #3 allow the city to reduce required minimum parking spaces. Keep the same density and have more open space (happier neighbors). Lower rain tax. Hordes, lemmings, doddering class? What a charming way to address the elderly who apparently didn’t nurture you as kindly as you deserved. Son, I trust one day you also will be old, and I sincerely hope you will be granted a little more respect. Further to my comment on Jacob Jacobson’s postings, lest I’m misunderstood let me say I applaud Mr. Jacobson’s willingness to put in print his rather politically-incorrect opinion on the subject of the elderly moving into his neighborhood. It’s far more desirable for a free country to have thoughts and attitudes out in the open, as opposed to silencing them. Whether there is “infrastructure” to handle increased population is not an issue. Freedom to buy and sell will solve that, and any other perceived problems. I think it’s a real shame how North Albany is being slowly destroyed….. I almost purchased acreage property there, but sure am glad I didn’t… Even the open space will soon disappear……. Jay Jacobson, Aging lemmings, really? What is your objection to seniors and aging? Everyone does age, there is no stopping the process. In my neighborhood there are trying to build 147 cluster homes which will bring more children to our already crowded schools and more cars to No. Albany gridlock. Yes, there are problems in No. Albany but throwing insults at human beings is not the way to solve them. The city council needs to stop approving residential development in North Albany. The infrastructure is not able to handle it now and it will only get worse if something isn’t done. Grace, there is no answers. City officials have stated there is not a lot they can do, they don’t really have a plan. Much of the traffic infrastructure will drop below acceptable standards in the near future with not a lot of funding to do much about it. Problem is there’s only a couple ways in and out and no way of stopping development in the boundaries that make up N. Albany…the downside of Urban Growth Boundaries. I think one of the things we may need to look at is having permits or some kind of tolling to use the residential streets through the neighbourhoods, we are getting a lot traffic cutting through trying to avoid 22. We need to create scarcity, since we do not have the supply. Lol, sorry HH, I was thinking about a certain someone in W. Salem and was having a discussion about how sad it is that we no longer have Orchard Heights Winery Sunday brunch, good times off Hwy 22. Kind of a subconscious thing I guess. 2) Reconfigure N. Albany Rd. at 20, yes 20. Only number 5 is on the schedule for implementation, and that’s a downgrade from the original round about project. The difference in costs between the two projects was transferred back across the bridge to other Ward projects. 2) City officials say this won’t do a whole lot to add any capacity. 4) No $$$ and not in the Urban Growth Boundary. The money that the County/ODOT is going to be spending, will be for bringing Crocker and Gibson up to usable specs. in order to transfer them to the city. Albany doesn’t want to take over control when the asphalt is only a couple inches thick, and then have to spend big $$$ to bring them up to standards down the road because they’re coming apart. So…what do you think? What do you think about tolls or bridge tolls? Or should we charge developers in NA for traffic enhancements to accommodate their new construction? That’s what they did for the round about at Gibson and N. Albany. And then if you do start charging additional development fees or change the code, how do you do that after someone has already purchased the property under the old rules? Or maybe we just cut off Gibson at Scenic, that would curb the cross through traffic, it would force more traffic down Independence Hwy, that would be an interesting traffic study. I think developers of these apartment complexes should have to include enough parking spaces for each apartment at each complex. One space for a one bedroom, two spaces for a two bedroom, etc… it’s ridiculous to have so many residents that have to park on the street! Parking should also include visitor parking for each complex; one visitor space for each apartment. Well, as a pre-baby boomer, I would like to remind all of you casting aspersion on the older folks, just remember two things: as you read my response you are as young as you will ever be, and, soon enough you will be joining the ever growing number of lemmings. You want to see gridlock. Try Salem, Eugene or Portland metro area. And for real fun drive north to the Seattle area. Grid lock from Joint Base Lewis McChord to the Canadian border.